Editor's Note: The property is closed. Bonneville Hot Springs Resort & Spa is a family-friendly, hot springs resort hotel and spa that promises an unforgettable getaway. 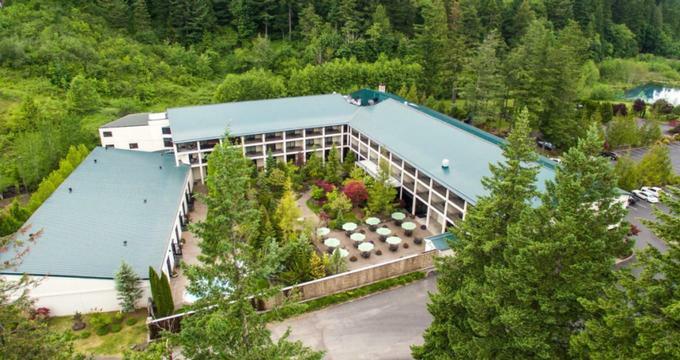 Situated just a few miles away from Beacon Rock State Park and the Bridge of the Gods, the resort hotel features comfortable accommodations with simple décor, private balconies, and modern amenities. Bonneville Hot Springs Resort features upscale facilities, including an exclusive spa, an indoor mineral pool, indoor and outdoor hot tubs, mini-golf and an on-site restaurant and coffee shop that both serve Pacific Northwest fare. The resort also has over 1,500 square feet of function and event space for board meetings, business functions, and corporate events. Meeting room facilities include sound systems, limited wireless Internet, flip charts, an LCD projector and projection screen, wireless microphones, and wireless headsets. Bonneville Hot Springs Resort & Spa features a variety of room types with comfortable beds and plush bedding, en-suite bathrooms with walk-in showers, soaking tubs, thick towels and deluxe bath products, spacious sitting areas with tables and chairs, and private balconies with gorgeous views. Modern amenities include flat-screen HD televisions with pay-per-view movies, iPod docking stations, direct-dial telephones, coffeemakers, refrigerators, and limited wireless Internet. Luxury Hot Tub Hillside and Courtyard Suites are available with a selection of views, including hillside and courtyard views, and private balconies with mineral hot tubs. Luxury Hot Tub Hillside Suites feature king-size beds with pillow-top mattresses and plush linens, sleeper sofas with queen size hide-a-beds, private bathrooms with walk-in showers and soaking tubs, and an extra-large balcony with eight-person hot tub. Bonneville Hot Springs Resort & Spa has an on-site restaurant serves fresh and healthy fare created from locally sourced ingredients, accompanied by an extensive wine list, and a coffee shop serves freshly brewed coffee all day. Bonneville Hot Springs Resort & Spa offers an array of amenities for guests to enjoy, ranging from an indoor mineral swimming pool, indoor and outdoor hot tubs, an exclusive spa and wellness center, and a mini-golf course. 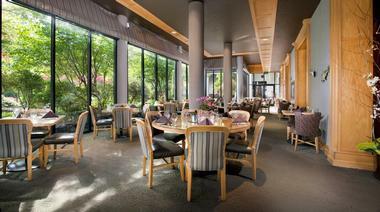 An on-site restaurant serves fresh and healthy fare created from locally sourced ingredients, accompanied by an extensive wine list, and a coffee shop serves freshly brewed coffee all day. Bonneville Hot Springs Resort & Spa has a range of activities for the whole family from soaking in the healing waters of the mineral springs and hot tubs to relaxing massages, hiking, and fishing. 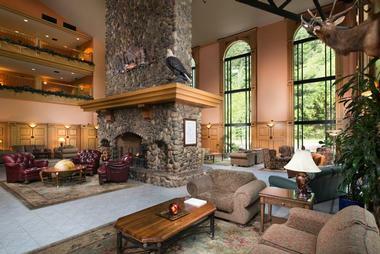 The Resort is located along the magnificent Columbia River Gorge, which offers excellent fishing, particularly salmon, as well as plenty of hiking trails to explore. Other activities include horseback riding, wine tasting, and golf at the Elk Ridge Golf Course. Other activities at the Resort and in the surrounding area include tennis, volleyball, and basketball, picnicking, children’s parks, horseshoe pits, baseball, and soccer. Hiking trails include the Pacific Crest Trail, the Hamilton Mountain Trail, the Aldridge Butte Trail, the Strawberry Island Trail, and the Ft. Cascade Trail. Other outdoor recreation fun range from fishing, dam tours, kayaking and canoeing to rock climbing, mushrooming, camping and boating. Bonneville Hot Springs Resort & Spa has an on-site spa that offers an array of spa services and body treatments for guests to enjoy during their stay. Spa treatments include body wraps, hot stone, aromatherapy and other massages, and skin care services, including facials, anti-wrinkle and anti-ageing treatments, bright eyes, lip and hands and feet treatments. Bonneville Hot Springs Resort & Spa has over 1,500 square feet of function and event space for board meetings, business functions, and corporate events. Meeting room facilities include sound systems, limited wireless Internet, flip charts, an LCD projector and projection screen, wireless microphones, and wireless headsets. Bonneville Hot Springs Resort & Spa also caters for special social occasions such as weddings, celebrations and other functions with a grand Great Rooms and several banquet rooms and first-class facilities such as an on-site spa, mineral swimming pools, hot tubs and a restaurant.